How did you envision yourself as a mum? I remember wrongly thinking when I was younger that there must be a natural motherhood shift where you become all ‘mumsy’, start wearing frumpy clothes, lose your social life and you generally just grow old before your time. I know – mindless stereotyping. How wrong could I have been? I’m surrounded and inspired daily by women who are mothers but also have a strong sense of who they are in this world; mothers who care about the way they dress, the items they choose to make motherhood easier but also reflect their sense of style too. I’m not talking about looking perfect and pristine everyday but more being confident in their own skin and owning who they are. Although fully accepting me for who I am can be a daily battle sometimes especially when I might catch myself in the mirror after three hours sleep, I always try and speak positivity into my insecurities. ‘You breastfed two children and gave them the best start you could give in life… who actually cares if you have cellulite on your legs? Get those pins out and own it sister…. bingo wings schmingo wings, take flight and soar to new heights and see new places you’ve never seen before’. I worried too much in my 20s about how I looked and what others thought of me, now in my 30s I am who I am and I try to be the best version of me. I know that we only live once and I’m determined to live confidently, bravely and without regrets and instil this into my boys. The thought of travelling with my boys fills me with excitement as well as anxiety; it’s more Remy to be honest because he’s such a wild child and so exhaustively unpredictable. BUT we can’t let that stop us and so we on go; hoping for the best instead of letting our insecurities get the better of us. The reason I’m talking about this is because we recently traveled by train down to London for the weekend, hopping on and off tubes, boats and trains and we did all this with the new Joolz Hub. It was a super hot weekend and so yes I got my pins out, although looking at the pics it may be a tad shorter than what I initially thought! 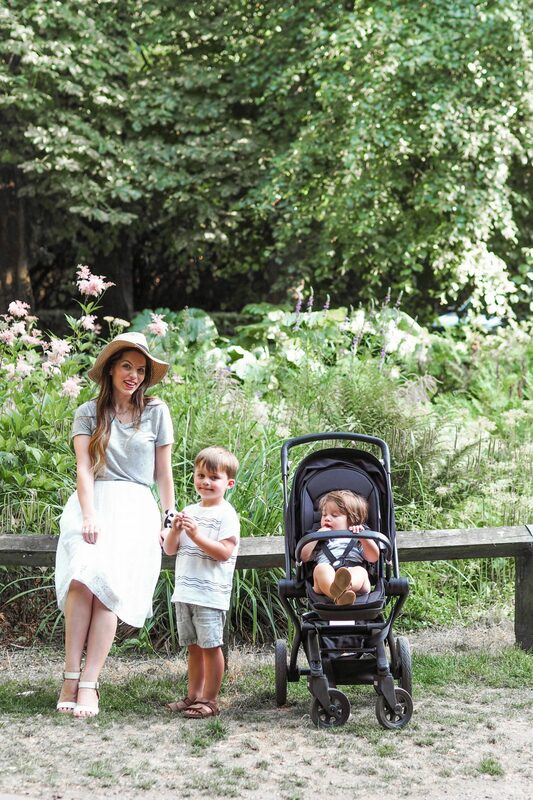 I felt a strong sense of keeping my style as a mother and a woman and the new Joolz Hub helped me feel this way with it’s sleek, stylish and classic look. 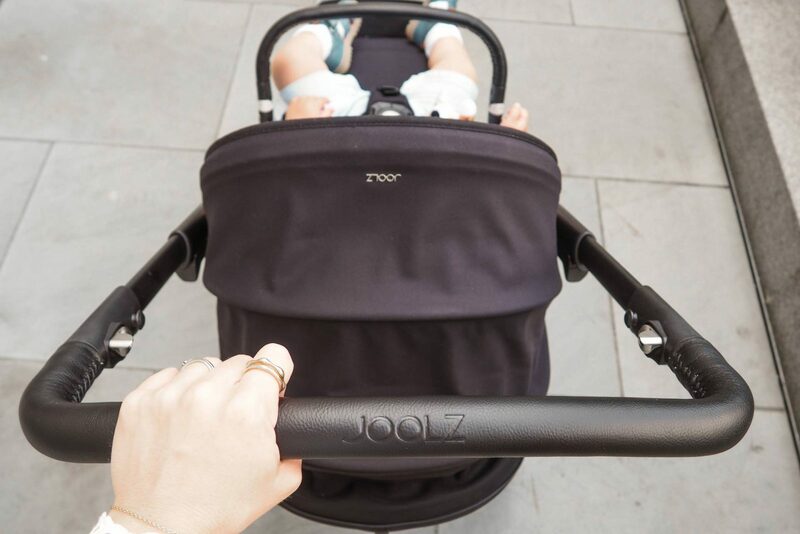 About a month ago I was sent the new Joolz Hub to test, review and give my honest opinion on, so that’s why we decided to take it to London with us on an all-action day; if it could pass this test, we were onto a winner. 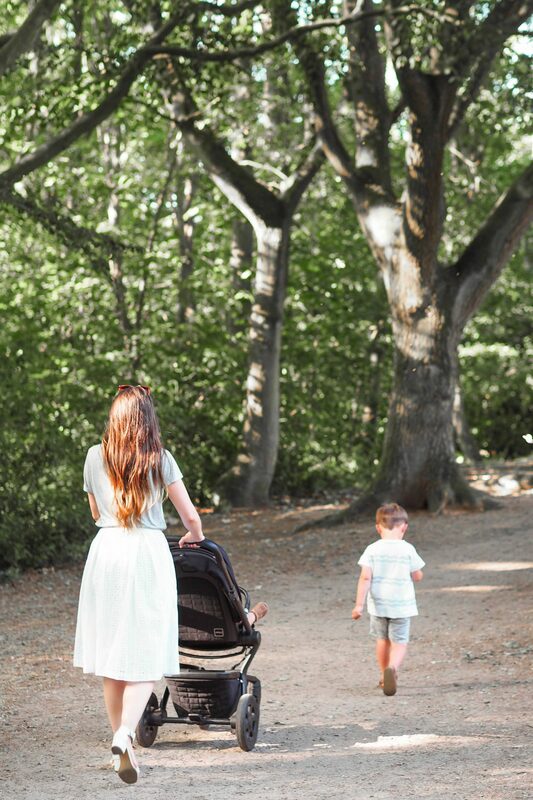 I thought it’d be easier to bullet point my likes and any suggestions for improvements along with photos that relate to those points, I hope you find it insightful if you’re currently looking for the perfect pram for you! I have popped a special code for you at the end of this post if you’re interested too :). It oozes so much style! Is it silly saying I felt proud to be pushing it. I adore the classic Joolz look; so sleek and looks kinda mean all in black. Like when you see those blacked out 4x4s, it seems like they’re king of the road… well, this felt like king of the pavements. You can push it easily with one hand even around winding roads and corners. As a mum of two you don’t realise how often you do this especially when you have a toddler to keep tabs on too; it’s always good to have a spare hand as a mum! The small wheels at the front and larger wheels at the back make it really easy going up and down curbs without much effort. 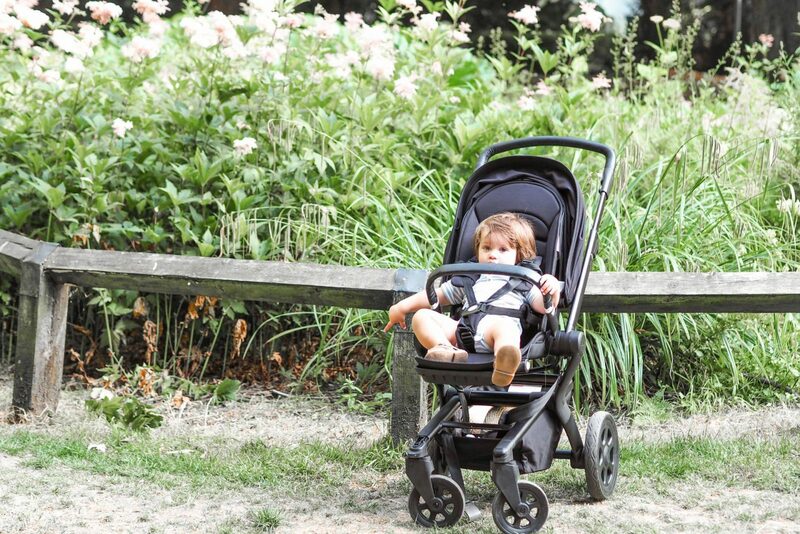 Also it makes for a smoother ride for your little one when it’s on more rough terrain. The handle extends quite far which is great if you’re quite tall too; Ayman loves this feature being 6ft 4ins. The hood… now this has to be one of my favourite aspects, it comes right over so the sun can be totally blocked out. There’s also a zip in the hood to extend it even more and has a mesh section allowing more airflow through the hood. The hood also has UPF 50+ which is amazing as it means your little one is also being protected from the sun. This is quite a big thing for me as I feel like it really helped Remy to doze off and sleep for longer. 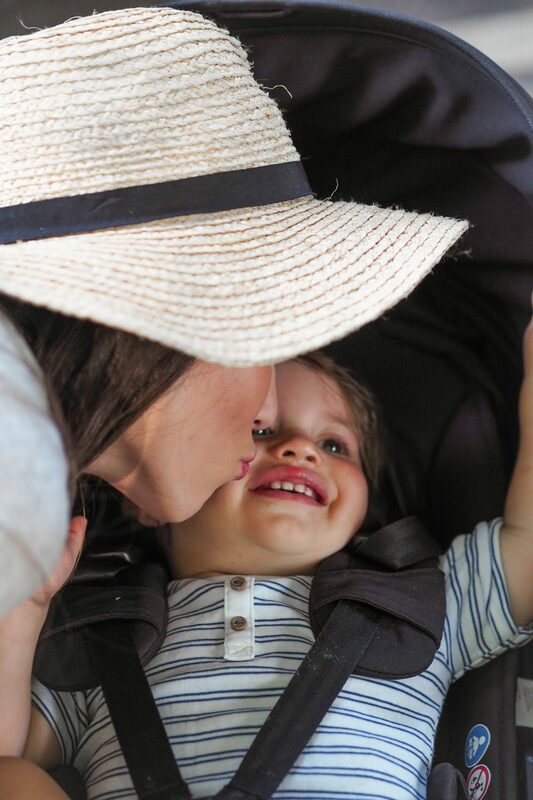 FYI he hardly ever falls asleep in a pram so this was a total game changer for us. The ergonomic seat has six different positions; again I think this had a huge part in Remy sleeping so well and it’s perfect for when he’s awake and wants to see everything. It also means that you can use it from birth as it has a lie-flat position. THE BIGGIE – it collapses into one piece and is compact enough that you can carry it by the handle bar or over your shoulder. 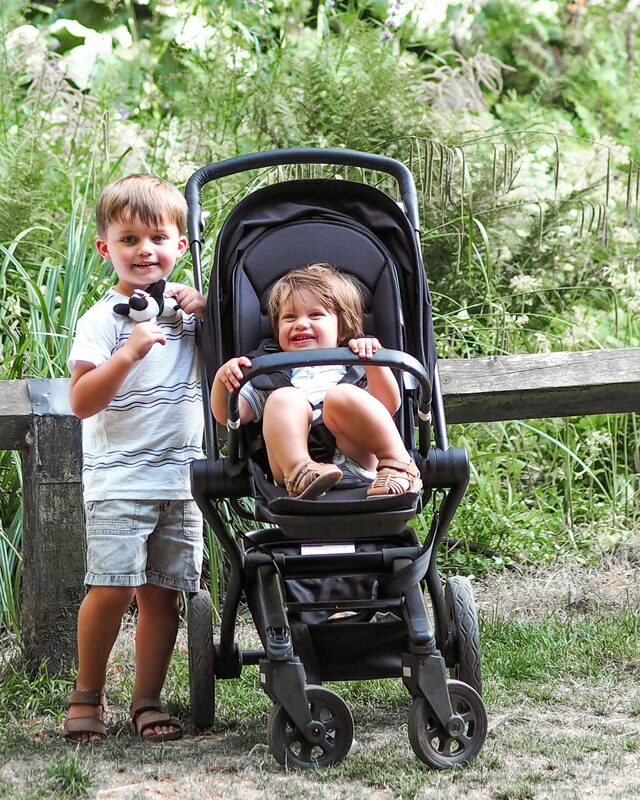 Perfect when travelling by train and when you need a sturdy pram on your travels. Also amazing that it doesn’t take up as much boot space, this made me very happy haha. You can also attach the new born baby crib section for the first few months if you didn’t want to use the lie-flat position on the main ergonomic seat section. You can have the seat facing in or out and it was also big enough for Hugo to enjoy a sleep in it too :). It’s perfect for city life as well as country life and taking your littles for more outdoorsy days. 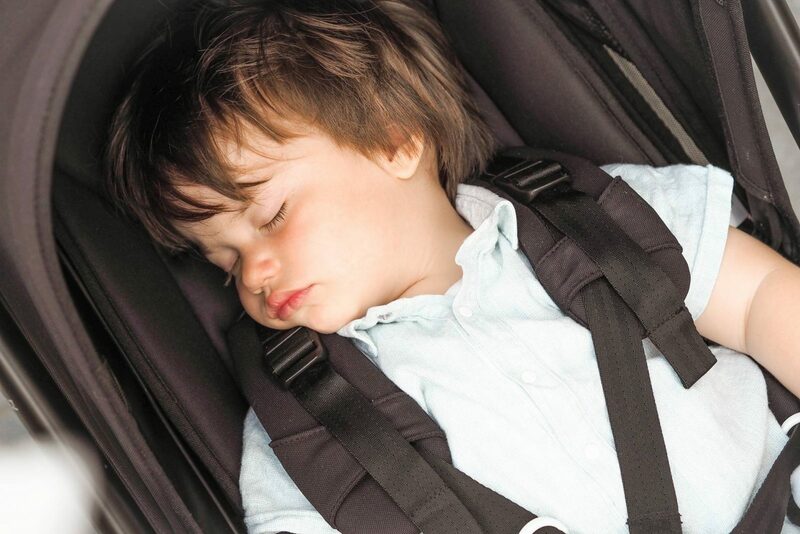 The five point safety harness around your child seems really comfy on them with the extra padding on the straps as well as keeping them safe and secure in the pram – no chance they’re going to wriggle out. Also easy to adjust as they grow. It’s a great price especially when you consider all of the above and that you can use it from birth and beyond and also with a car seat too! It’s like the compact version of the larger travel systems but costs a fraction of the price :). 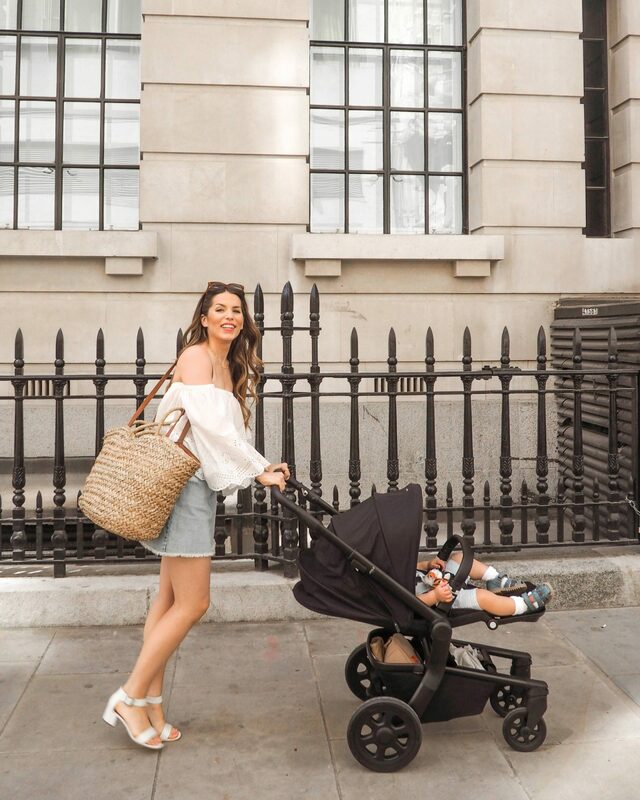 The basket – although it’s a decent size, it doesn’t seem as big as my other Joolz pram and instead of having the option to put my bag under the pram I had to pop it over the handle bar instead. I think this is because it’s made to be more compact though so I can’t have it both ways! It’s amazing that it quickly compresses into one compact piece but it is quite heavy to carry over your shoulder for a long period of time… clearly that shouldn’t happen too often though. That’s it! It’s evident that the good far outweighs the bad. Needless to say, I’m a big fan. If you are considering the new Joolz Hub, don’t forget to use this special code below and you’ll receive a FREE Joolz Essentials Blanket in a colour of your choice when you purchase a Hub. Thank you so much to Joolz for allowing me to be one of the first to experience this new pram and test it out. 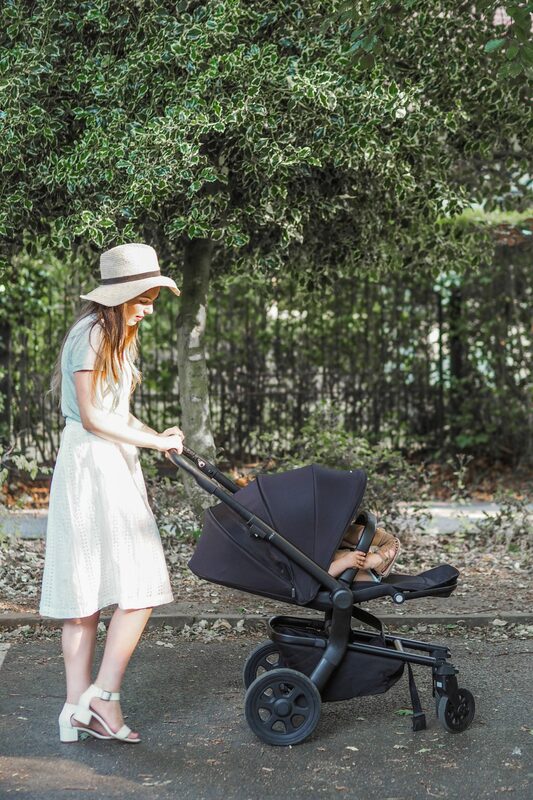 For me it’s a total game changer; the fact it can collapse as one, the extra long sun hood and seat recline positions and the fact it can be used from birth too. 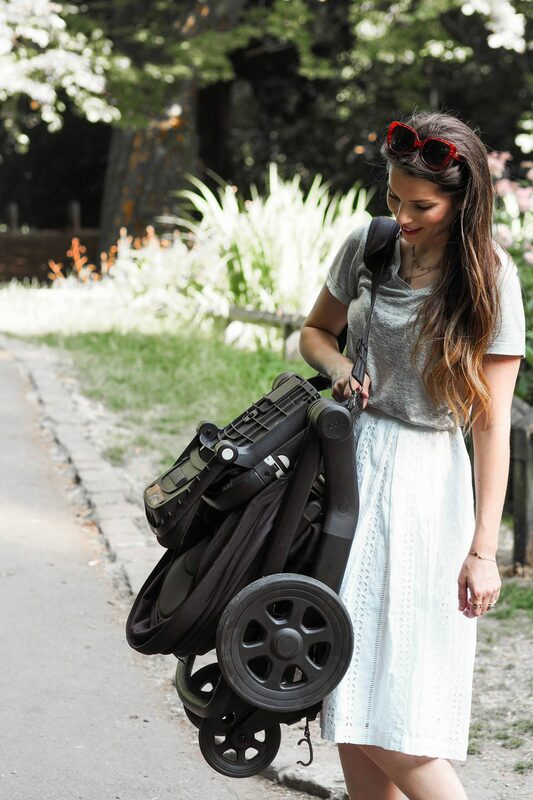 It’s a beautiful, sturdy and stylish pram with so many amazing features to make parenthood easier on the road. If you have any questions at all please feel free to leave them below and until next time, have a truly wonderful week! I’m proud to say this post was kindly sponsored by Joolz. As ever, all thoughts and opinions are my own. I only blog about brands, products and services that I truly connect with, would genuinely use, and would legitimately recommend to others. Enjoyable read, and useful. Imminently about to embark on parenthood for the first time and posts like this are so useful. We’ve just purchased our pushchair, I guess you’d call it that these things can do everything! Our mindset was to get something that could accompany us on our favourite pursuit National Trust estates at weekends. However, after reading this an edition of a more city-friendly compact buggy could be very useful, real-world use will give us that answer. I like the way you make it look effortless that you can carry it over your shoulder when needed, but yet the design also seems very sturdy and able to handle all day out and about versus some of those cheap flimsy lightweight strollers you see in stores that you do wonder how they even last week. It amazes me the thought that goes into these products a world I was not aware of until expecting our first. What a brilliant post Sal. 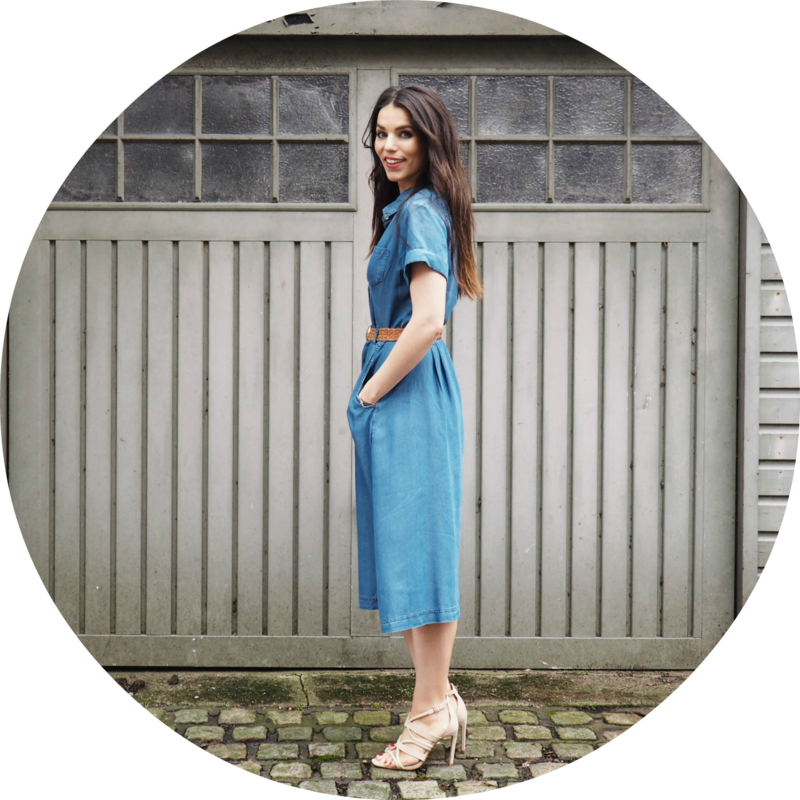 So honest and insightful – we love Joolz too and this looks and sounds like a brilliant pram. And get those pins out beauty – you’re such a gorgeous mama and yep you need to own it!